Tetraplegia, or quadriplegia as it is sometimes referred to, is the result of a severe spinal cord injury. It can occur as the result of numerous sporting accidents; rugby, horse riding, trampolining, diving and gymnastics are common activities where a freak accident can lead to paralysis. It can also be caused by both whiplash and impact injury. One minute a person will be fit and active and within seconds they can be paralysed or severely restricted in movement and in need of support for the rest of their lives. Tetraplegia differs from paraplegia as the victim suffers complete or partial paralysis from the neck downward, affecting all four limbs and the body. 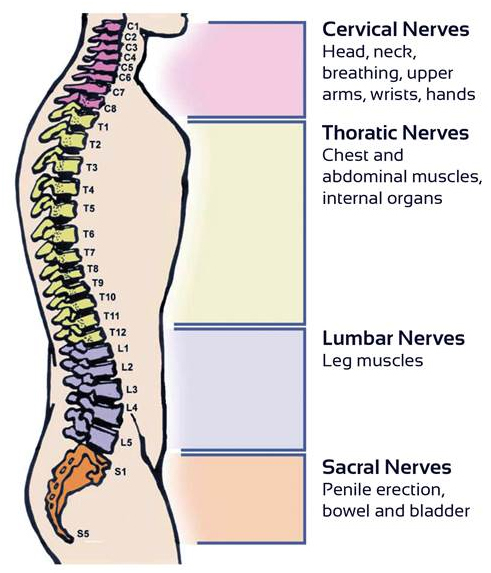 It is the result of damage to the spinal cord between C1 and C8. The worst kind of injury – where the spinal cord is severed at the highest point – is often referred to as the ‘Superman’ injury (as experienced by the late Superman actor Christopher Reeve) where the sufferer is completely paralysed from the neck down and requires a ventilator in order to breathe. On average 1,200 people are paralysed every year in the UK. 50% become tetraplegic as a result of their accident and 10% of these people have their accident as the result of a sporting accident. There are therefore 40-60 people in need of support from Regain every year. This is in addition to the existing 300 plus tetraplegics on our database.